Dc plug: 5.5*2.1mm,5.5*2.5mm,3.5*1.35mm, micro/mini usb etc. o Small volume, light weight, high efficiency. o Cooling by free air convection. o 100% Full load burn-in test. 2.Best Price:Products are produced in our factory,so we are entitled to control the quality well and reduce the cost to offer more competitive price and excellent quality. 3.Strong production capacity:over 200000 pieces per months. 4.Prompt delivery time:3-5 working days. 5.Professional technological team: Your tailored/customized connectors and package are welcome. 6.Good after_sales service: 1 year warranty. 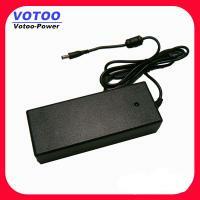 7.Leading supplier:we have more than 10 years experiences in power supply industry. Before connecting check whether the power supply fullfields electrical specification (output voltage and current). Also check the socket type and its polarity. Connect power supply to the supplied unit. Power supply must be connected to a working electrical AC line with a voltage of 100-240V. Do not install power supply in locations with high humidity, dust or strong direct sunlight. The power supply should be installed in a location with good airflow. Power supply can only be installed indoors. AC wire should connect tight with adapter socket, in case poor contact socket.